Headhunt Revisited: With Brush, Canvas and Camerais a documentary film about Caroline Mytinger and the power of art to span oceans and decades. 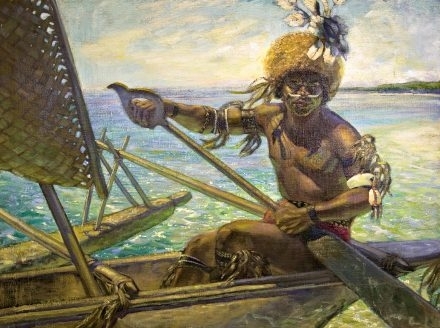 In 1926, Caroline Mytinger set out on a four-year adventure to the “Land of Headhunters” in the Solomon Islands and Papua New Guinea to paint Melanesia’s inhabitants. Eighty years later, her work inspires American photographer Michele Westmorland to retrace Caroline’s journey and Papua New Guinean painter Jeffry Feeger to interpret contemporary counterparts of Caroline’s paintings. Headhunt Revisited connects these artists in a story that is personal and universal, illustrating how art transcends time, genre and geography, continuing to inspire new generations of artists and non-artists alike about the importance of documenting culture and tradition.